The leader in the club house so far is Vasque’s newest model of the Breeze boot, the Breeze 2.0 GTX. Light, breathable, supportive. The top contender so far. 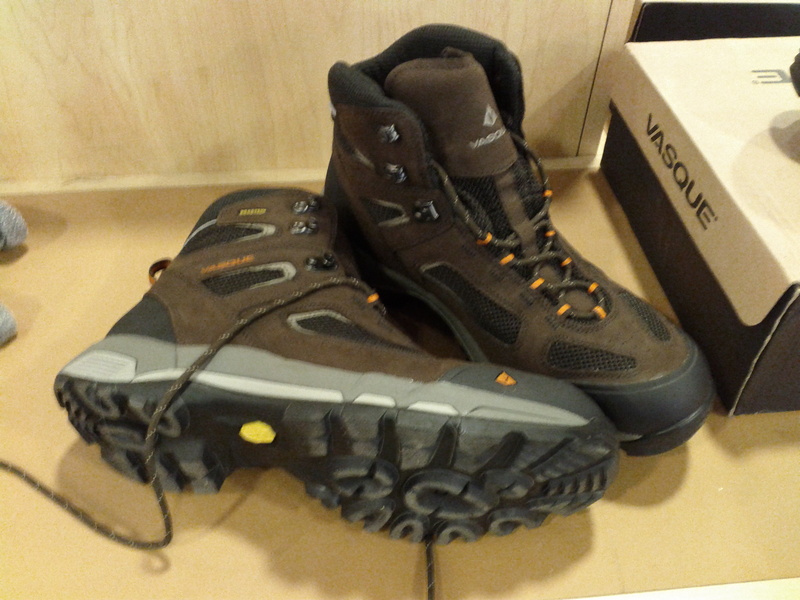 Vasque is a newer brand to me (despite the fact that they have been around for almost 50 years). My past three pairs of hiking boots have all been by Merrell. I have loved my Merrell boots as they have all been traditionally very sturdy, supportive, great traction and very comfortable. However, they have run a bit on the heavier side and have not been very which I am trying to avoid this time around. So, when I was at EMS earlier this week I tried on three pairs of Vasque Boots: The Breeze 1.0, the Breeze 2.0 and the Wasatch. The Breeze 2.0 was my favorite of the bunch. I was really surprised at how light they are for a boot that had a lot of coverage. I wear size 14 boots and I am used to them being very heavy and clunky. My first thoughts were I should be targeting a low-cut trail shoe to cut down the weight and increase maneuverability I have strong ankles and I was not as worried about the full support or protection that higher cuts offer. The Breeze 2.0s are mid-cut boots providing higher ankle support and protection while they are also very light. This particular model of boot has the Gore-Tex lining which will cut down on breathability but there were side panels of fabric that would give what looks like good ventilation points. Additionally, my foot fit very well inside the boot. Traditional hot spots for me are on the heel, at the wide part of the foot and the top of my foot. And each of those areas were snug but not too tight. The other aspect that I liked was that the sole was not too stiff, allowing for movement and flexibility while climbing over rocks. I look forward to trying some more boots over the next few weeks. One of the challenges is that there are not many outfitters around Portland so options are limited. It will take some investigation and perhaps a trip down to REI in Boston to see more. Ultimately my goal is to make my decision by the end of April, just in time for the warm weather to hit and the snow to be gone! This entry was posted in Gear and tagged EMS, Hiking Boots, Hiking Gear, Merrell, Vasque. Bookmark the permalink.